Sketching with a coffee and a good friend. by Myfrenchkitchen.In home, kitchen, objects.22 Comments on Sketching with a coffee and a good friend. A good day is when you get that unexpected call from a very good friend from far away. And after a long conversation, without “pretense and expectation”(quoting her words), you can put down the phone, feel inspired, have a wonderful cup of coffee and draw closer the sketching tools. Colette and I have shared many coffees over many years. We have shared abundance and empty purses, shopped on impulse as well as on budget. We rode challenging waves and sailed calm waters, we ate fish and chips at three in the morning and elegant strawberries at midday, we wore hats and bought hats and laughed at our own reflections, we drank champagne in strangers’ empty homes and dug up kitchen floors in search of gold. We shared freshly caught lobster on the beach and we licked our fingers from barbecues under the African moon. And we talked. Listened. We still talk and we still listen. This is for you, Colette. Thank you for lifting my spirits this morning; for having me cry my heart out and for leaving me with joy. While enjoying my coffee this morning after the call, I felt The Urge. It has been a long time since I felt The Urge. You can also call it that hit of inspiration, working of the muse, the bulb moment, the end of the tunnel, the light in the distance….You can even call it panick attack; for feverishly grabbing the paper and pencil and water and brushes, before it leaves! So I did actually produce four sketches. None of them turned out as I planned which I accept, seeing how few things in life do turn out according to plan. I have about 3 cups of coffee a day. Starting off in the morning with a big bowl of coffee in which I can dip a chunk of bread or a biscotti as we bake them in South Africa…called beskuit(rusks). Pen and WC in moleskine. Then moving through the day I’ll have a cuppacino in just a mug.. Pen and WC-pencils in moleskine. Leaving just enough room for that extra special cup around a fire, when the coffee is no good, but the atmosphere and stories fill the enamel mug with bursting aroma and flavour, making it the best cup of the day. Pencil and WC in moleskine. And what a fruitful Urge it was! These are beautiful, Ronell. I can decide between the last two – for a favorite that is. I think it is the espresso for the wonderful pattern. It is also lovely to share your tribute to your wonderful friend but so frustrating not to hear the full story of some of these memories. You dug up a kitchen floor looking for gold!!!!? You know Ronell, I love your commentary as much as your images! Both are gorgeous and insightful. After deprevation of good rich coffee in London (didn’t find Shirley’s Caffe Nero till the night before we left), then wonderful morning capuccinos in Italy and comforting cafe con leche in Spain…only to be spoiled by cafe creme, espresso and chocolate chaud in Paris….it sure was nice to come home to my coffee grinder/maker in my kitchen and enjoy all 3 of Ronell’s daily cups in one sitting! Darling, your story moves all of us who enjoy life, love and friendship…and coffee!!! I must choose the first cup as it is your first cup of the morning, the detail around the rim simple like some days start out to be…..I feel special that I too got to enjoy 2 cups of coffee with my new friends Ronell and Casey. Bon journee mon ami. If I could I’ll join you in coffee. With the exception of the one in the morning I always take small expressos. Love particularly the first one. I too love coffee and enjoy my time with my various cups throughout the day. The earthtone colors of your first two are gorgeous – both your loose style and choice of muted colors. Your espresso cup looks lots like my Gaudi cups – gifts from Barcelona. What a fantastic series. Wow, when inspiration hits, you certainly take advantage of it! These are simply gorgeous. Ooooh! Ronell, you’re inspiring me again! I read your post and ran to the phone to call a good friend of mine that I haven’t spoken to for awhile. We had a wonderful chat and now I’m feeling like grabbing the “tools”….. 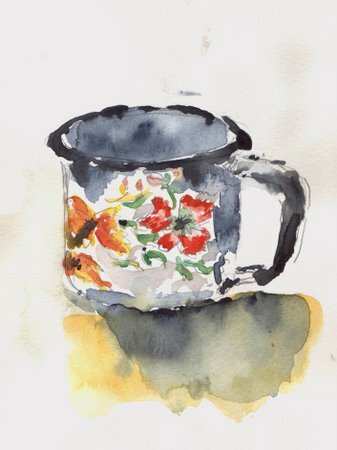 I love your coffee sketches especially the colorful ones! 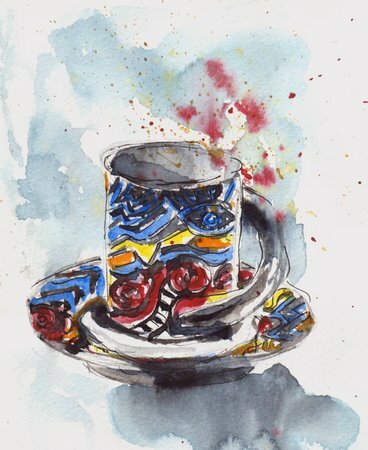 Maybe I’ll paint tea cups…. I’ve switched to tea for the afternoon because I drank my 3+ cups of coffee already today. Though I can’t stand even being near coffee, I love your series of coffee sketches and the post. They are all wonderful, and it’s a pleasure to view them. Ronell, I could ‘listen’ to you for hours…the wonderful art is the cherry on the top! I have chosen your post for my STAR POST list. Oh, what blessings those days, and urges, are!!! SO SO THRILLED that this has happened to you … and I am as thrilled with the work you’ve produced. May the muse remain, cara ….! Colette – what a wonderful surprise to see your comment here….’n grooot lekkerte! 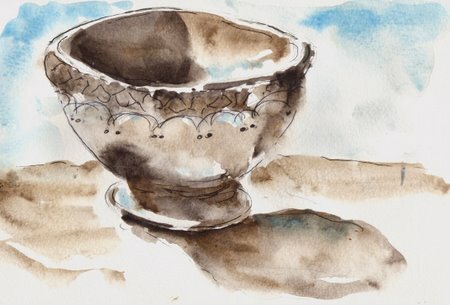 Bec – wonderful for calling your friend…I hope you’ll do your tea cups…will keep an eye on your blog! Anita – thank you Anita…I’ll have a look at your star Post! What a beautiful and inspiring post. I kept finding myself nodding along in agreement, while I giggled and cried. And, as always, your loose colorful paintings are pure joy for the soul. Ronell found you through Everydaymatter – I live in Edinburgh Scotland I emigrated here from SA in 1977. I love dipping rusks in coffee and I treated myself to borevors , coffee and a rusk at the only SA cafe in the city. Ahhh tin mugs! My mom has bequethed me her tin plates which she got when she married in Pietermartizburg. I love the top one, it looks very monumental. Wonderful! They get more exciting as they go. 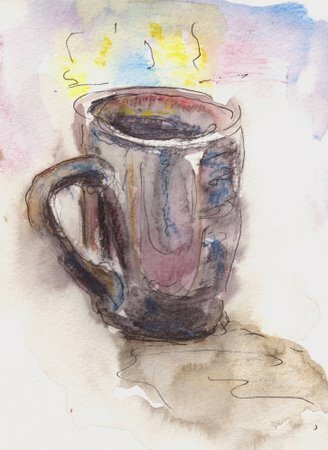 Was it the urge building, the addition of more coffee, the warming up of the drawing hand….so glad the muse came for a visit along with your dear friend’s call. I thought I commented on these before. They are so beautiful Ronell. I like this post’s thematic paintings. They are all lovely. I cannot stop smiling on the idea that you have designated cups for different occassion. You certainly know how to celebrate life, Ronell. I love these here!! Beautiful!